This page describes how to create a Bamboo job in a stage of a plan. You can either create a new job, or clone an existing job. You must have the 'Admin' or 'Create Plan' global permission to create jobs. A job allows you to collect together a number of tasks that you want to be run sequentially on the same agent. Click the name of the plan in the list. Click Add Job in the stage where you want the new job. Click either Create a new job or Clone an existing job. Plan to clone from — Select the plan containing the job you wish to clone. Plans are grouped by project in the list. Only plans for which you have the 'Clone' and/or 'Admin' plan permission are shown. Job to clone — Select the job you wish to clone from your selected plan. Jobs are grouped by stage in the list. 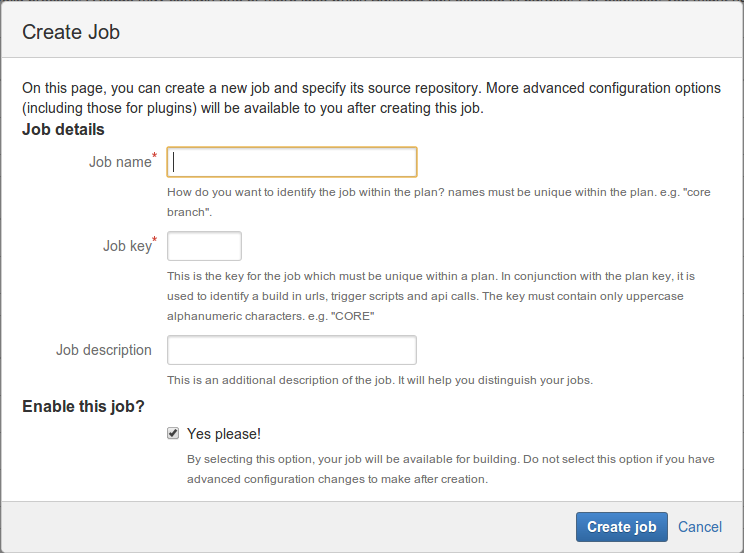 If you wish to configure tasks for the job, such as configuring a Repository Checkout, see Configuring jobs.